Or view larger version. First Congregational Church. April 30, 1942. Professor Chiura Obata, artist. Painting. Collection of the Oakland Museum of California. Gift of Chiura Obata. 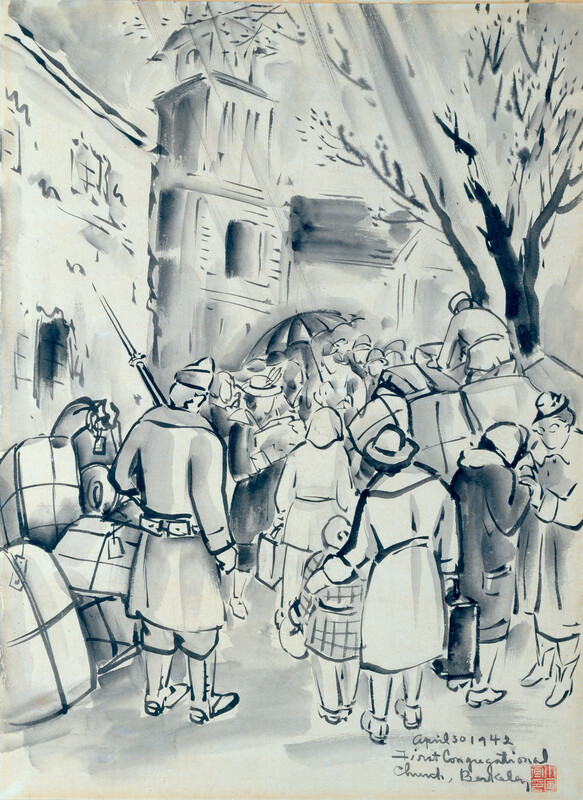 This painting depicts a group of Japanese Americans reporting for relocation at the First Congregational Church in Berkeley, California. In March, 1942, President Franklin Roosevelt had signed Executive Order No. 9102 establishing the War Relocation Authority, which would organized and operate the internment camps. The following month, the council of the First Congregational Church voted to make the church available to the Army for the registration of Japanese Americans in the area.